Can belief survive First Contact? It’s true; we are not alone. Casimir “Caz” Fortel isn’t sure what god brought the Ghiqasu into Earth’s orbit fifteen years ago, but life on our planet hasn’t been the same. There isn’t any war and cleaner energy is as common as cars; life should be good. Aliens made a deal to provide advanced tech and employ humanity’s soldiers in interstellar battles as part of Earth’s role as a protectorate in exchange for humans halting all wars and allowing the Panstellar Consociation to build a warp tunnel in orbit between Earth and the moon. Not bad. But while life goes on for Caz, living undercover and recovering stolen artwork – as he puts it, “lying for a living,” he’s left wondering if this all there is. Because the arrival of the aliens tore a gaping hole in humanity’s collective history and mythology, and for many, hope has taken a vacation. For Us Humans works on multiple levels and it’s an enjoyable mystery and almost-police procedural as Caz, a gifted liar, sets up his mark to relieve them of stolen artwork (think a more leisurely, lonelier version of The Sting scored with higher tech). But Caz got a new partner and a new mark. While Caz can change his hair, his eye color, and his story to fit any case, he can’t change his prejudice against the qwaddies, and his new four-armed partner and target are a bit interstellar. Nil, Aphu Nil Hemilh Jeq, is a disgraced Ghiqasu warrior and Prime Investigator for the Consociation’s Retrieval and Justice Team. He and Caz are partnered in a retrieval scheme for a statue that, while microscopic, masks a case that reaches higher than it would seem. Can Caz and Nil recover the statue before bigger, badder aliens step in? Can they protect humanity even as the stakes are raised? It’s 48 Hours meets Men in Black in a buddy-cop caper rife with pop references, sarcastic banter, and more than a few aliens as Caz and Nil race to cover the irreplaceable artifact. Steve Rzasa has crafted an engaging mystery wrapped in a unique voice that’s all Caz, with believable world- and character-building. It’s a world that seems as close as tomorrow with an overarching question that most will find they’ve pondered before. As a Christian, I’m not arrogant enough to think we are alone in the universe nor astute enough to know what God has planned. Raza has his finger on one wonderfully beautiful possibility in this quirky, relatable science fiction tale. 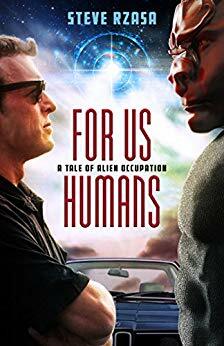 While For Us Humans has a strong Christian bent, I think it will also be enjoyed by those who love deep, fresh science fiction plots and devices that leave you thinking long after you lay the book down. I hope this is the first of a series, but it is definitely a stand-alone novel. Absolutely loved this story! Highly recommended for scifi aficionados, Christians, fantasy lovers, and those who enjoy a good mystery, not to mention, those who love twisty stories of folks with the gift of the Blarney Stone. Caz Fortel is a great liar. In fact, he’s a professional. It’s his job to lie to people who steal works of art, and to get the goods back. But when Caz gets the big call from the FBI—a million bucks to recover a stolen statue of significant cultural value—it comes with a downside. His assigned partner has more of an interest in Jesus than Caz is comfortable with. Oh, and he’s an alien with four arms and a tremendous sense of smell.